As the Waves MultiRack SoundGrid gets more and more integrated into the industry, I am having more opportunities to talk to end-users and find out what their opinions are, and why they decided to use SoundGrid. What I have discovered is pretty interesting. Engineers come to use SoundGrid for totally different reasons. Currently SoundGrid is supported by Yamaha and DiGiCo consoles. I have discovered that most of the users of these consoles are not familiar with plugins. Users of Avid (Digidesign) consoles generally chose Avid live consoles because they were already familiar with Pro Tools recording, and had some pretty extensive experience with plugins; I know that this is the case for me. One of the reasons that I chose to switch to a digital format console, from my trusty Midas XL4 with tons of racks of gear, was the ability to use plugins and software models of analog gear I was familiar with from recording to pro tools and logic. The problem is that getting people to try something new is akin to trying eel for the first time at the sushi bar. You want to try it, but you just aren't sure. Then when you do try, you think to yourself, “Why haven't I been ordering this all the time?” In my experience, if you just give SoundGrid a chance, you will never want a Yamaha or DiGiCo console without SoundGrid. There’s also a small sect of engineers out there that never fully believed in Digidesign products (for whatever reason), and have been waiting for plugins to be available on other formats. Hop on in, the water is warm. Isn't it awesome that we have choices? Some engineers have serious convictions about digital spec information. I still maintain that we should use our ears and quit looking at the spec in order to determine a superior sounding product. But, as in life, choices are what make the world a uniquely awesome place. Some like vanilla, I like chocolate, and some weird people even like bubble gum flavored ice cream. Who's to say that bubble gum flavored ice cream is not satisfying to that person? I would challenge you to find any concertgoer out there and ask them if they thought that the higher sampling rate device used on the vocal made a difference. The guy with the forty ounce beer standing right next to FOH and screaming his head off for the entire show doesn't care what gear you are using, as long as it sounds good. So, as engineers, we are creatures of habit. Change is bad. We must evolve, however. From the primordial slime of 24 channel analog consoles, to the upright apes of 128 input digital consoles, SoundGrid ushers in the era of homo sapiens. It is adding a highly developed brain to the already bipedal primates. 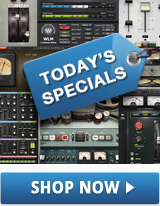 Digidesign users: Check out some of the newer plugins that waves has been releasing recently. I have been using the Kramer PIE compressor on my bass guitar DI. It's awesome. Yamaha and DiGiCo users of SoundGrid: Welcome to the wonderful world of Waves plugins. Try using some of the software models of analog gear that you are familiar with at first. This will get you warmed up for the Waves custom-built plugins that are amazing.